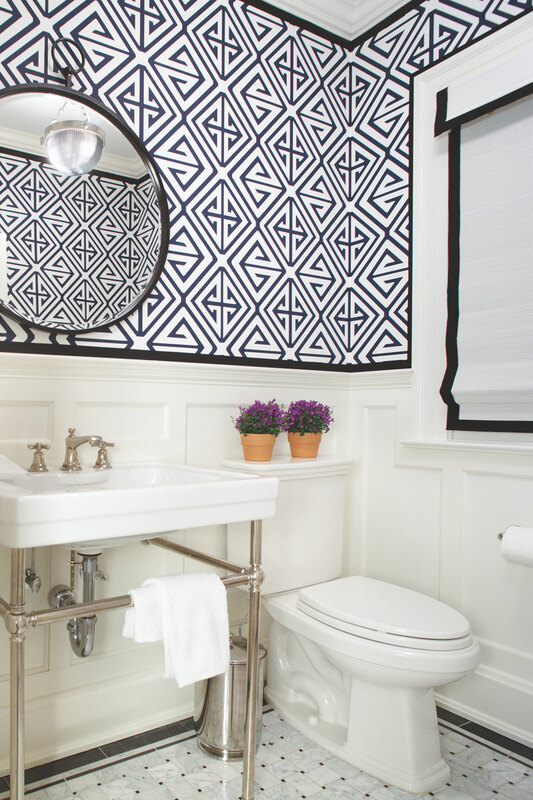 In Ridgewood, NJ, a calming master bathroom and a lively powder room reflect the history of the home. Mirrors above the vanity feature leaded-glass borders punctuated by rosettes, a nod to the era of the house. The freestanding bathtub, with its slightly modern profile, blends past and present effortlessly. Sheer white linen café curtains contribute to the muted affect in this space. “I went for very simple, clean lines,” the homeowner says. Overall: design, Jennifer McGee Design Inc. in Ridgewood; millwork and design of custom mirrors, Robert Breeman of Braunius Bros. Construction in Midland Park. Master Bathroom: wall color, Blackened by Farrow & Ball Ltd.; window treatments, Schumacher; wall and floor tile, Stratta, the Tile Boutique in Wyckoff; mirrors, custom designed by Robert Breeman of Braunius Bros. Construction and the homeowner, fabricated by Studio J Inc. in Paterson; sconces, Visual Comfort in Houston; bathtub, Victoria+Albert Bath; bathtub faucet, Waterworks. Powder Room: Wallpaper, Thibaut in Newark through Jennifer McGee Design Inc.; grosgrain ribbon trim on window treatment and walls, Samuel & Sons in New York City; mirror, Arteriors Home in Carrollton, Texas; light fixture, Hudson Valley Lighting in Wappingers Falls, New York; floor tile, Wayne Tile Co.; toilet, Kohler; sink, American Standard through Ferguson Bath, Kitchen & Lighting Galleries.